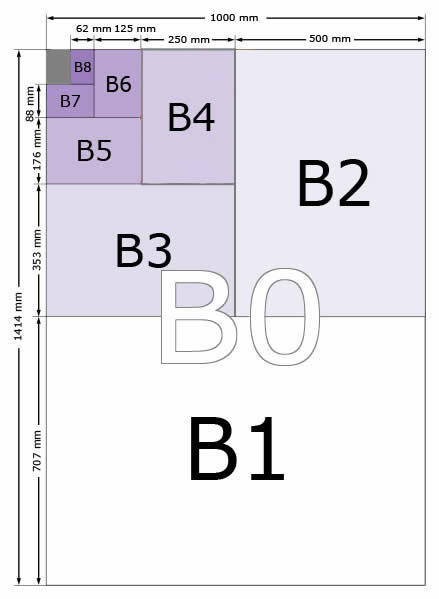 The dimensions of the B series paper sizes, as defined by ISO 216, are given in the table below in both millimetres and inches (cm measurements can be obtained by dividing the mm value by 10). The B Series paper size chart is a visual explanation of how the B paper sizes relate to each other. To obtain sizes in centimetres, convert mm values to cm by dividing by 10 and in feet by dividing inch values by 12. More units here. The B series paper sizes were created in order to provide paper sizes that weren't covered by the A series, but also use an aspect ratio of 1:root2. B sizes are defined as size B(n) being the geometric mean of size A(n) and size A(n-1). The Geometric Means of 2 numbers being the square root of the product of the two numbers. As with the A series paper sizes, the standard lengths and widths are rounded to the nearest millimetre. B2+ and B1XL (Also known as B1+) are oversize/uncut B paper sizes. These are not defined by ISO and have come about due to an industry need. The commonly used dimensions for these sizes are given in the following table. Theoretical sizes for RB (105% of the area of the corresponding B size) and SRB (115% of the area) sizes are given in the following tables.